Order three View-Master sets for only $55! Add $6 for shipping for up to two complete sets. Add $12 for international shipping. Shipping will be via US Mail unless requested otherwise. View-Master set of "Glimmer: The Haunting of the Graham House" by Christopher Schneberger. View-Master set comes with 3 reels (21 images) and insert detailing the story. The reels are new, custom made by Alpha Cine for the artist. The Graham family - John, Sarah, and their two children - live in a house built at the turn of the 20th century. 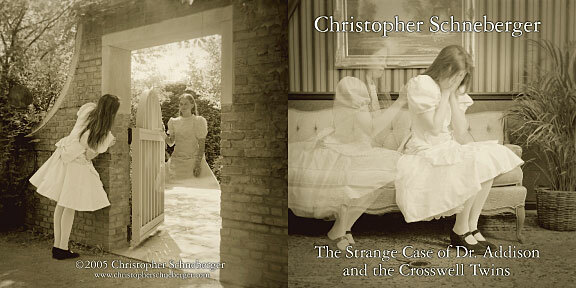 They live with an unusual houseguest; the ghost of a young woman from the past. Each family member has a different relationship with the girl. These photographs, made over the course of a two month stay with the Grahams, detail the day to day lives of the Graham family and the girl. Add $6 ($12 international) for shipping for up to six sets. 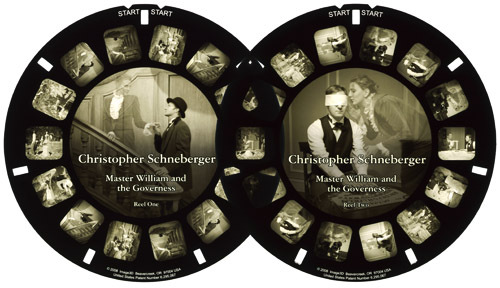 Limited Edition (300) View-Master set of "Master William and the Governess" by Christopher Schneberger. View-Master set comes with 2 reels (14 images) and insert detailing the story. The reels are new, custom made by Image3D for the artist. William Clarke was born to wealthy parents in 1887, but he was primarily raised by the family's governess, Sophia Ashton. Tragically, Sophia died suddenly when William was only thirteen. The legend holds that as Master William became a young man, he was visited on numerous occasions by the spirit of his governess who continued his education. Add $5 for shipping for up to four sets. 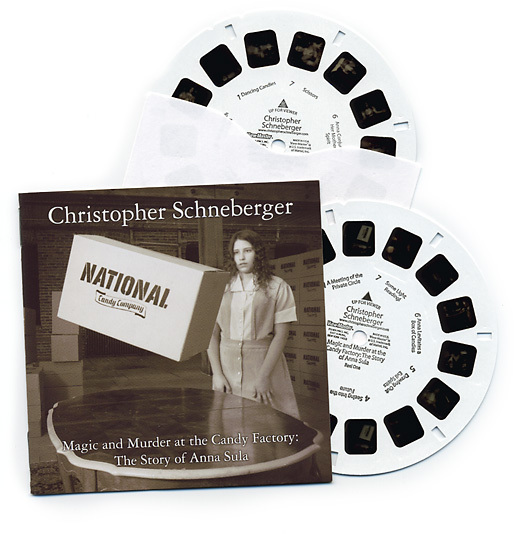 Limited Edition (500) View-Master set of "Magic and Murder at the Candy Factory: The Story of Anna Sula" by Christopher Schneberger. View-Master set comes with 2 reels (14 images) and 8 page booklet detailing the story. The reels are new, custom made by Fisher-Price for the artist. Each reel is signed and hand numbered. In the midst of the Depression, a teenage orphan was murdered at the Chicago factory where she worked. A clerk at the factory was charged with the crime after evidence was discovered showing he had an obsession with the girl. Recently, other evidence has surfaced that calls that finding into question. Was there a cult meeting in the building after hours? Did the orphan, young Anna Sula, have supernatural abilities? 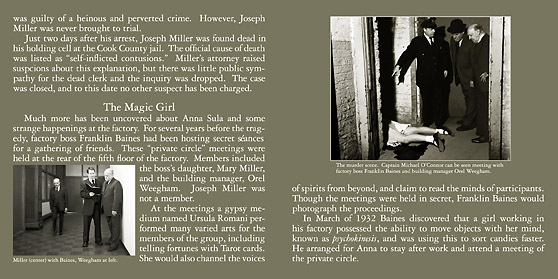 In an exhibition at Printworks Gallery, housed in the same building where the murder took place, Christopher Schneberger created an installation detailing the story, and presenting never seen before evidence including photographs revealing Anna's incredible powers, and perhaps her true identity. 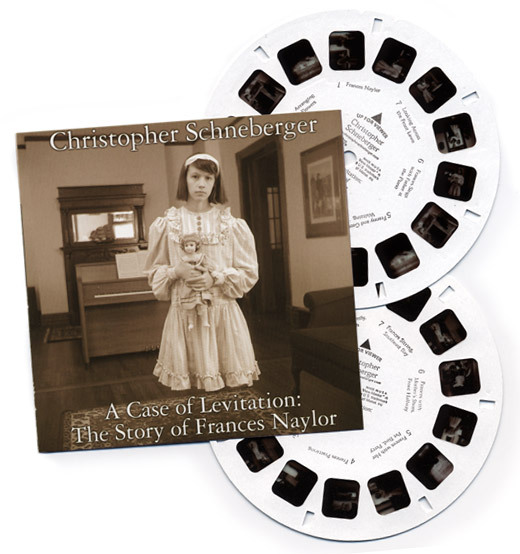 Limited Edition (300) View-Master set of "A Case of Levitation: The Story of Frances Naylor" by Christopher Schneberger. View-Master set comes with 2 reels (14 images) and printed insert detailing the story. The reels are new, custom made by Fisher-Price for the artist. Each reel is signed and hand numbered. 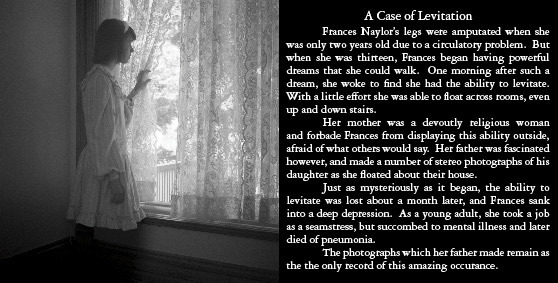 Frances Naylor's legs were amputated when she was only two years old due to a circulatory problem. But when she was thirteen Frances began having powerful dreams that she could walk. One morning after such a dream, she woke to find she had the ability to levitate. Her mother was a devoutly religious woman and forbade Frances from displaying this ability outside. Her father was fascinated however, and made a number of stereo photographs of his daughter as she floated about their house. Just as mysteriously as it began, the ability to levitate was lost about a month later, and Frances sunk into a deep depression. She was later institutionalized and died later of pneumonia. The photographs which her father made remain as the only record of this amazing occurance. 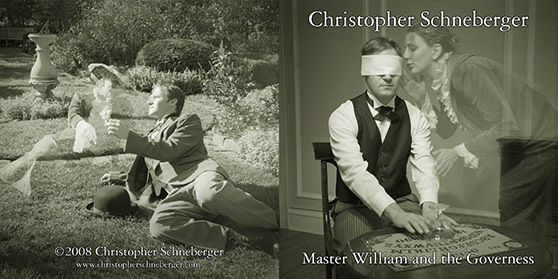 Limited Edition (300) View-Master set of "The Strange Case of Dr. Addison and the Crosswell Twins" by Christopher Schneberger. View-Master set comes with 2 reels (14 images), printed insert detailing the story, and one black viewer. The reels are new, custom made by Fisher-Price for the artist. Each reel is signed and hand numbered. 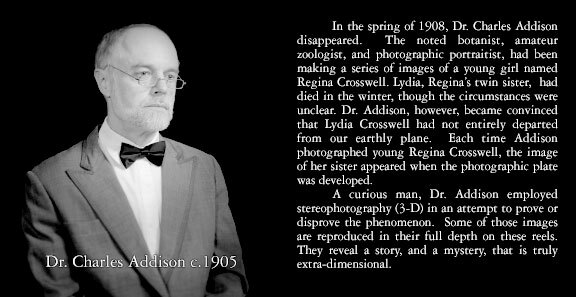 In the spring of 1908, Dr. Charles Addison disappeared. 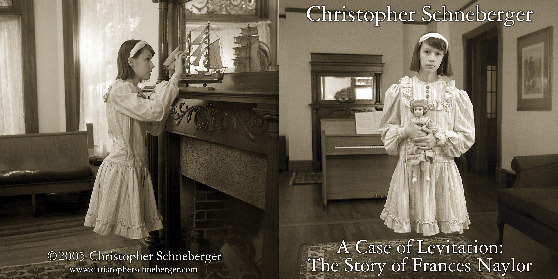 The noted botanist, amateur zoologist, and photographer, had been making a series of images of a young girl named Regina Crosswell. Regina's twin sister, Lydia, had died in the winter, though the circumstances were unclear. Dr. Addison, however, had become convinced that Lydia had not entirely departed from our earthly plane. We have re-created Dr. Addison's studio and invite you to visit, peruse the photographs Addison made, and draw your own conclusions.